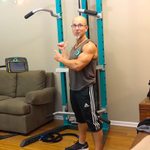 This training session can be used by Non Home-Gym owners as well as Home-Gym owners. While this can be done by beginners - don't let the "mat" aspect of it fool you. This is a very well-rounded session that targets all the muscles of the lower body, including some of the core. It is also ideal for travel fitness (vacation, business, etc) as well as for use at the office (corporate fitness - workplace wellness), since it can be done without common fitness-center machines or typical health club equipment.